When someone asks if I’m going to be a chef I say yes, but only because it’s the simplest answer. There is no easy way to explain what a chef is. Chefs of today are celebrities, activists, and business-people. Some are chemists; some are artists; some are farmers. No one would disagree with calling Ferran Adria, Grant Achatz or Dan Barber a chef, but their work extends far outside the kitchen. Because there is so much that it can entail, I’m not exactly sure what being a chef means. When asked if I want to be one, I don’t know where to start. Chefs are, most obviously, at the forefront of cuisine; chefs push the limits of what we consider food. At el Bulli, Ferran Adria used techniques which seemed more appropriate for a chemistry project than a kitchen. Because of him though, foaming, gelation and spherification have become part of the kitchen vernacular. He completely took apart everything that we knew about food in order to meticulously study it. While pushing the limits of cuisine, chefs have crossed the line between food and art. 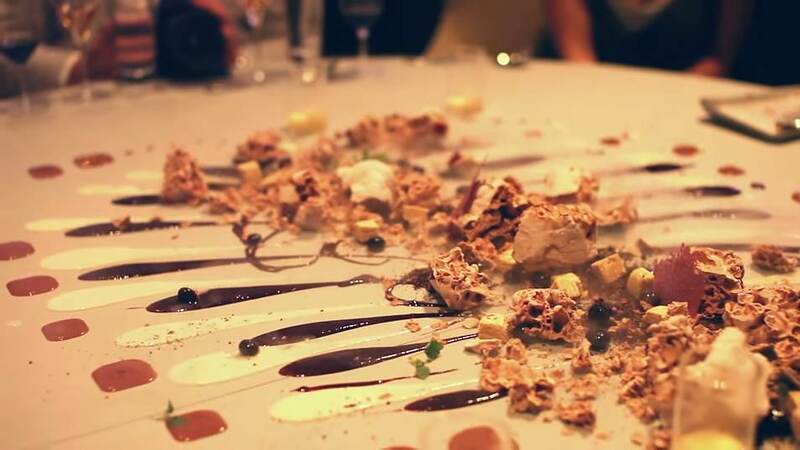 Dishes have taken on names more reminiscent of a painting than a plate, such as “Forest Floor.” One dessert at Alinea is quite literally painted on the table in front of guests. Like an artist, Grant Achatz aims to produce an emotional experience for each diner, but while painters are limited by sight and musicians by sound, chefs can paint a picture using every sense. As some deconstruct or dress up their food, other chefs are reducing their menus to a simple list of ingredients. Instead of standing in the spotlight, they step back to showcase the food and celebrate the farm. At Blue Hill at Stone Barns, diners eat only what is local and in season. The meal is driven by the farm, not by the chef or the guest. Dan Barber relishes the fact that he can step back and let his food speak for itself. It is the perfect marriage of restaurant and farm. Adria is often given credit for establishing molecular gastronomy – the modern cooking movement that analyzes and celebrates the social, artistic and technical aspects of cooking – but he is the first to explain that food is not his sole focus. He is on a continual search to learn and create. Now that el Bulli is closed, he’s expanding his search beyond the kitchen. The new el Bulli Foundation aims to deconstruct and examine what we know about creativity itself. Whereas Adria deconstructed food to examine it, Achatz dresses it up to tell a story. He realizes that by using all five senses, he can produce a profound emotional experience for his guests. Instead of describing his food in terms of tastes and textures, he uses cerebral words like nostalgia, intimidation, and humor. When Achatz is in the kitchen, cooking isn’t as much a physical craft as it is a narrative experience. To accomplish their creative goals, Adria and Achatz both take apart and transform the food they work with. Dan Barber’s cooking at Blue Hill is a stark contrast. Instead of an artist, Barber is a curator; he cultivates his food and then lets it shine unadulterated. On every step from the farm to the table, he carefully tends to it in order to achieve maximum flavor and nutrition. Barber is a steward between the farm and the table, the critical link between where food is grown and where it is eaten. All three of these chefs realize that eating is simultaneously a social, artistic and technical craft. Despite how different their cuisines are, they share similar core philosophies. Each understands that good ingredients come from good farms; each understands that eating is an emotional experience; most of all, each understands that they have the ability to influence how people learn, think and, of course, how they eat. Being a chef today is like no other time in history. We have to be backyard farmers and basement chemists, avid researchers and tireless innovators. This is why when asked if I’m going to be a chef, I’m a little unsure of my answer. There’s so much a chef can be. For the next six months, we’ll be exploring the question: What is the chef of today? Stories from the Lab: Sous Vide: So Good!